Blythewood High School is the fourth high school in Richland School District Two. The 294,000 square-foot facility features state-of-the-art technology and flexible learning environments which anticipate the needs of a new generation of learners. A thoughtful and participatory planning and programming process helped this District envision space requirements that emphasize a learner-centered environment that supports a diversity of teaching styles. The large facility for 1,700 students is organized into a series of smaller communities, each composed of four houses that support academic and grade level curricula strategies, each with views of the 11 acre lake to the east. Each “house” or “academy” is designed to foster a strong sense of community, encouraging students to utilize classrooms and public spaces as learning environments. A center locker commons located on each floor in each house provides students with a gathering place where they can meet with peers while minimizing student traffic throughout the building. 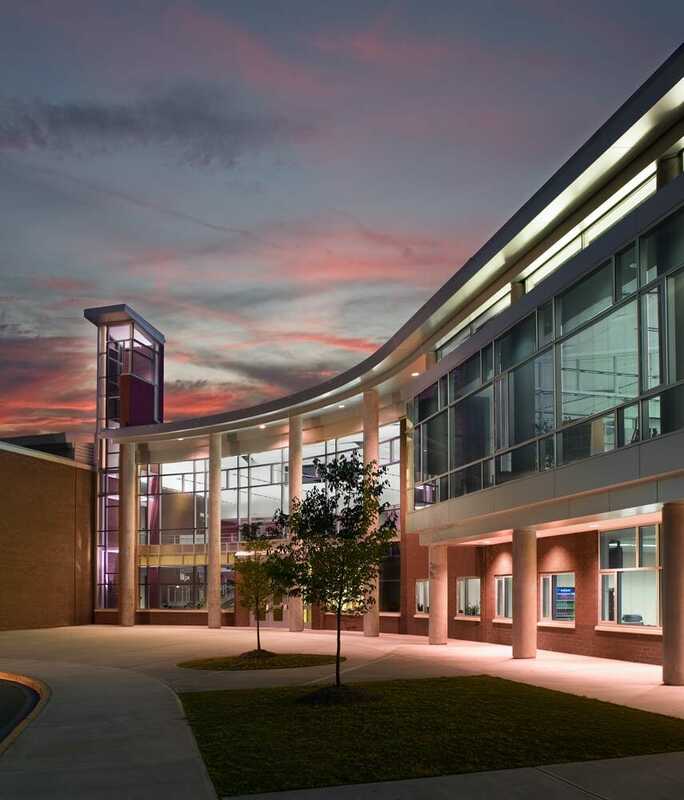 Distributed administration, counseling and teacher offices overlooking the parallel corridors and locker commons areas create a connection between students and educators, further emphasizing a sense of community. Small group rooms, a cyber cafe and central gathering areas provide spaces for both teacher-student and student-student teaming, studying and research. The science and vocational activities are located parallel to the house row and as such are an integral part of the education experience. The primary community-stakeholder spaces such as media center, cyber cafe, lobby and locker commons all share commanding views of the adjacent renovated lake.